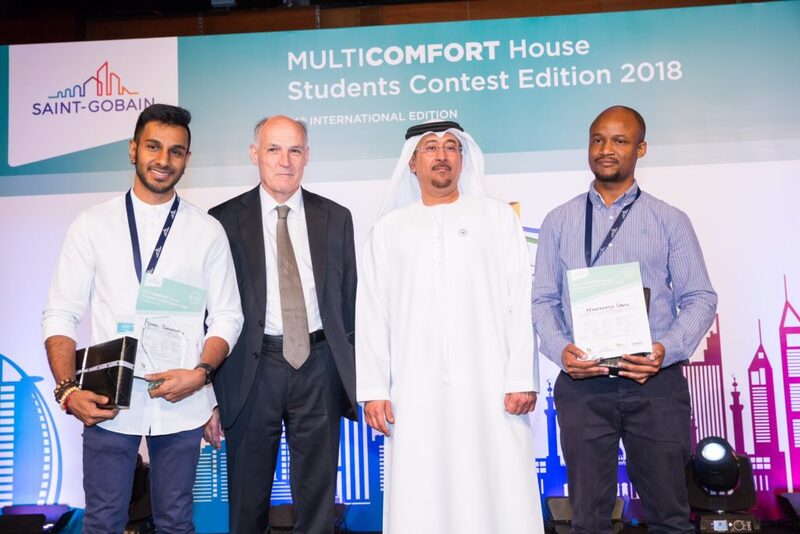 The MultiComfort House Students Contest was chaired by Pierre-André de Chalendar, Chairman and Chief Executive Officer of the Saint-Gobain group, and Mr. Dawood AbdulRahman Al Hajiri, Director General of Dubai Municipality. 50 architecture and engineering student teams from 28 countries presented their projects in four pitch sessions to an international jury including representatives of the Dubai Municipality, architects and experts. The first prize was awarded to Vahin Parmananda and Mthokozisi Sibisi from University of KwaZulu-Natal in South Africa. Vahin Parmananda and Mthokozisi Sibisi receiving their awards. For more information, please see the press release below or download it here.